USD/CHF: With the pair following through higher on the back of previous week gains the past week, more strength should follow. On the downside, support lies at the 0.9650 level. A turn below here will open the door for more weakness towards the 0.9600 level and then the 0.9550 level. On the upside, resistance resides at the 0.9750 level where a break will clear the way for more strength to occur towards the 0.9800 level. 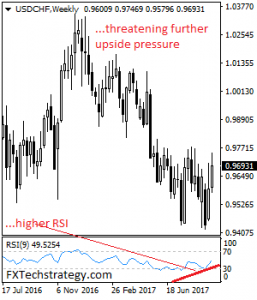 Further out, resistance comes in at the 0.9850 level. Above here if seen will turn attention to 0.9900. All in all, USDCHF faces further upside pressure short term.